It is quite possible to transfer energy and charge (or rather gorge) from one capacitor to another with high efficiency. The energy-transfer efficiency can approach 100%, and the gorge-transfer efficiency can easily exceed 100%. These numbers far surpass the limits that are often assumed, “proved”, and/or “explained” in the physics education literature. We discuss a simplified version of a technique that is very widely used in the electronics industry. Let’s consider the so-called “Two Capacitor Problem”. Suppose we have two capacitors, as shown in figure 1. Initially there is some energy stored in the left capacitor (shown in blue) but zero energy in the right capacitor (shown in red). The objective is to transfer “some” energy from one to the other. Figure 2 shows one scheme for performing the transfer. When the switch is closed, a current flows. The subscript “12” refers to the whole system, i.e. both capacitors together. This works, but as we shall see, it is not the only possible scheme. Indeed it is nowhere close to being the optimal scheme. In the symmetrical case, i.e. N=1, we see that 1/4 of the initial energy remains in C1, another 1/4 is successfully transferred to C2, and half of the initial energy is dissipated in the resistor. In the large-N limit, almost all of the initial energy is dissipated in the resistor. The most remarkable thing about equation 3 is that the results are independent of R. So in some sense this a “universal” result. One might even imagine that equation 3 remains valid even when R=0. However, this doesn’t make sense, because the dissipated energy is dissipated in the resistor. 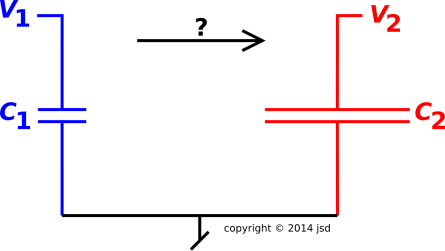 This is the infamous two-capacitor “paradox”. The usual way of resolving this “paradox” is to argue that there is always some parasitic resistance (not shown in the circuit diagrams), so that in the limit where the explicit resistance R goes to zero, the parasitic resistance becomes dominant. If nothing else, there will always be some radiation resistance. A tremendous amount of effort has gone into “proving” that this result is universal, and/or “explaining” why it is mandatory, and/or accounting in detail for the “lost” or “missing” energy. I would argue that all of this work is seriously misguided, because in fact the result is not universal and not mandatory. Under ideal conditions, it is possible to transfer energy from one capacitor to the other with efficiency approaching 100%. It is possible to transfer gorge with efficiency considerably greater than 100%. Even taking into account the nonidealities found in real-world circuits, it is possible to very greatly exceed the limitations suggested by equation 3. It is also possible to bring the two capacitors into equilibrium with each other, again without dissipating anywhere near as much energy as suggested by equation 3. Let’s be clear: For macroscopic systems (E≫kT), the laws of physics do not place any inherent limits on how efficiently energy can be transferred from one capacitor to another. In passing from figure 1 to figure 2, we added a switch and an explicit resistor. You could also add a parasitic resistor and/or an antenna to represent radiation resistance. However, there is no law of physics that says these are the only possibilities. The same physics that allows us to understand capacitors, resistors, switches, and radiation also allows us to understand inductors. A particularly interesting possibility is to add an inductor and some switches, as shown in figure 3. Switch S3 is normally closed, and will remain closed until further notice. Proper operation of this circut requires some deft timing, as we now discuss. We start by closing the left switch (S1), connecting C1 to the capacitor. This creates an LC oscillator, a simple harmonic oscillator. The initial condition is shown by the highest point on the blue trace in figure 4. We call this the 12:00 point on the blue trace. The spreadsheet used to compute the waveforms and phase-space plots in this document is cited in reference 2. After waiting a quarter of a cycle, the system has evolved to the 3:00 point. All of the energy has been transferred from C1 to the inductor. This is interesting, but not maximally convenient, because the current in the inductor is flowing in the “wrong direction” for our purposes. However, if we wait an additional half cycle, the system will evolve to the 9:00 point, where the current is flowing in the desired direction. At this point we open the left switch (S1) and close the right switch (S2) connecting the inductor to C2. This creates a different LC oscillator, with a different period. The new period is longer than before by a factor of √N. At this point in the diagram, the trace switches from blue to red. Now we wait an additional quarter period, i.e. a quarter of the new period. This takes us to the 12:00 point on the red trace. At this point – assuming ideal components – all of the energy has been transferred to C2. In particular, comparing with equation 4, we find that this scheme produces more gorge on C2 by a factor of (N+1)/√N ... which is a factor of 2 already when N=1 and gets even bigger for large N.
Let’s be clear: In the circuit we are considering here, i.e. figure 3, we wind up with more gorge than we started with, for any N greater than 1 ... not only more final gorge than we would have gotten with figure 2, but more than we started with. There is no law of physics that requires gorge to be conserved. You may have noticed that in figure 2 the final gorge was equal to the initial gorge, but this is not a consequence of any deep physical law; it is merely the consequence of some engineering choices that were made ... not even particularly clever engineering choices. In addition to the phase-space plot in figure 4, we can get some additional insight by looking at the waveforms as a function of time, as in figure 5. The ordinate is the gorge on both capacitors combined. However, the capacitors take turns, so the blue part of the trace represents the gorge on C1, while the red part represents the gorge on C2. 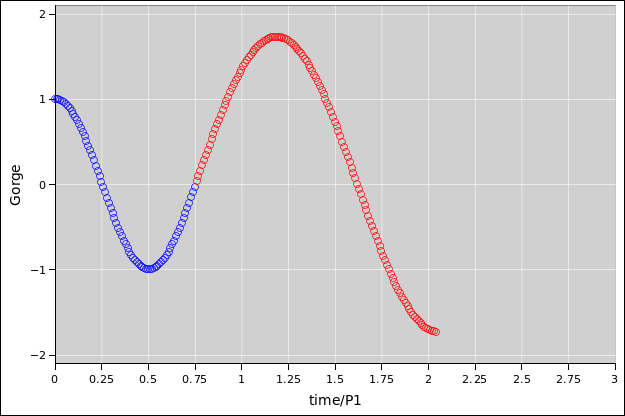 The period of the “red” LC oscillator (P2) is longer by a factor of √N, but this has no bearing on the units used for the abscissa in the plot. Note that to make the diagrams, the value N=3 was chosen. 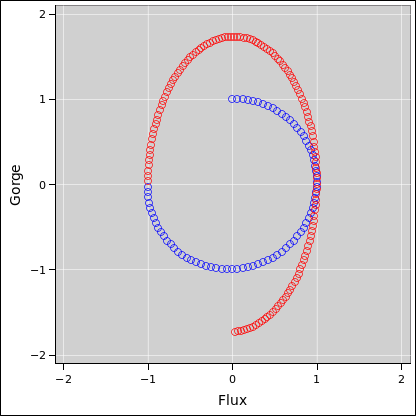 Note that a full cycle of the red trace in figure 5 is identical to a full cycle of the blue trace, just scaled up by a factor of √N ... scaled up in both the gorge-direction and the time-direction. As a corollary, the slope is the same at corresponding points. In particular, at the point where the red trace splices onto the blue trace, there is no change in slope. We can understand this in physics terms as follows: The time-derivative of the gorge is the current. At the splice-point, we are switching the current from one capacitor to the other, but it is the same current, so the slopes have to match. not only do the gorge-traces match as to slope, they also match as to second derivative. They both have zero second derivative, i.e. zero curvature. The chosen splice-point is an inflection point. Here is a third way of understanding the scaling relationship. It follows from the Maxwell equation. There is some current flowing in the inductor. If the voltage is less, the current flows for a longer time. Let’s change gears slightly. Suppose that rather than transferring all the energy from C1 to C2, we only want to transfer enough so that the two capacitors come into equilibrium, i.e. so that they have the same voltage. We can do this using the same circuitry as in figure 3, just using different timing. Everything is the same as in section 3 for the first three quarters of a cycle, up to the point where we throw the switches. Recall that at the 9:00 point on the blue trace, both capacitors are at zero voltage. In this case, we leave switch S1 closed when we close switch S2. Thereafter the two capacitors remain locked together, with a common voltage. The period of the combined oscillator (P12) is longer than the reference period by a factor of √1+N. To make the diagrams, the value N=3 was chosen, so P12 = 2 P1. 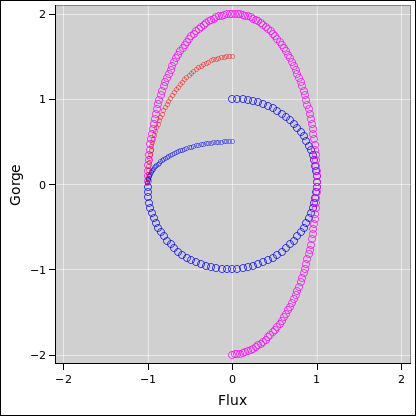 In figure 6 and also in figure 7, the behavior of C1 and C2 separately are shown beyond the splice point, using small blue and red circles. They are rather less interesting than the total system behavior. Compared to the RC scheme in section 2, the equilibrium voltage obtained here is considerably larger. Also the equilibrium gorge is considerably larger. Compared to the transfer scheme in section 3, the final gorge achieved here is slightly larger. The voltage is less, but the gorge is larger. Gorge is not conserved. We can also look at the waveforms as a function of time. 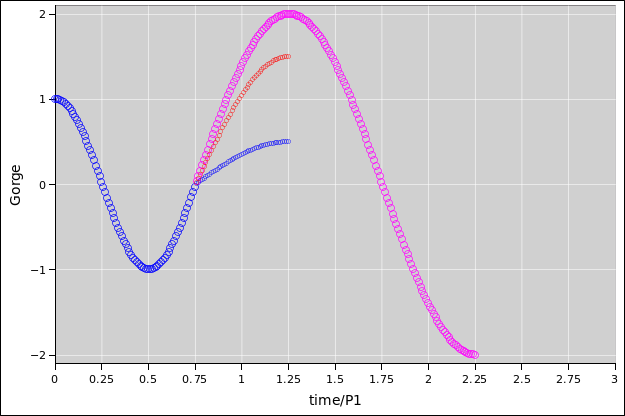 Again there is a scaling law: The magenta curve is a scaled-up version of the blue curve, scaled in both the time-direction and the gorge-direction. The two cases considered in section 3 and section 4 are not the only possibilities. By properly arranging the timing, you can transfer almost any fraction of the original energy (from 0% to 100%), with high efficiency. The power supplies for modern electronic equipment use inductors and cleverly-timed switches, using the same sort of principles as discussed here, only more elaborate and more sophisticated. This stands in contrast to power supplies using dissipative elements in series. Such devices are similar to figure 2, but with a transistor in place of the resistor. Such devices exist, and used to be very common, but they are very inefficient, and became obsolete several decades ago. Back in the bad old days, the power supply for a computer would be a significant fraction of the size and weight of the whole computer, and would be responsible for a goodly fraction of the energy budget (and also the cooling budget). 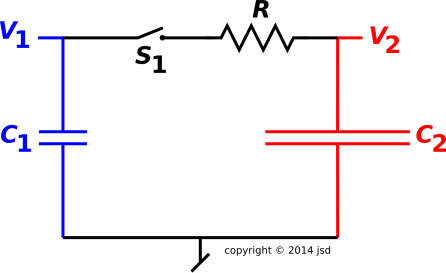 This family of circuits is widely used for the purpose of DC-to-DC conversion. Many DC-to-DC converters are also known as buck/boost regulators, alluding to the fact that the same circuit can handle input voltages that are greater than or less than the desired output voltage, which is something that would be hard to achieve using a plain old dissipative Class-A regulator. Such circuits are available in a wide range of sizes, from a few milliwatts to a few gigawatts. Applications at the small end include LED flashlights. Applications at the large end include HVDC power lines that carry power to entire cities. Note that DC is sometimes significantly more efficient than AC for long-distance power distribution, especially if the cables run underwater. The importance of efficient regulators and converters is almost beyond description. The survival of civilization as we know it depends on greatly reducing dependence on fossil fuels. This requires both (a) increased efficiency and (b) increased use of renewable energy sources such as solar-, hydro-, and wind-generated electricity. All this involves circuits of the type we are considering here. In most applications, the switching frequency is rather high, much higher than the 50 or 60 Hz associated with the power mains. A higher frequency allows the use of smaller capacitors and smaller inductors. The principles discussed here also apply to non-electronic systems including mechanical systems. In particular, something that would otherwise be a highly inelastic collision can be turned into a very nearly elastic collision by suitable engineering, including springs and levers. Many sports use something like a bat or a racquet to make energy transfer more efficient. Mechanical weapons such as a slingshot or a bow-and-arrow depend on efficient transfer of energy. The idea of an impedance-matching transformer is in some ways different but in some ways related. The operation of the circuit in figure 2 is simple. You can thrown the switch and then go get lunch. The capacitors will come into equilibrium and then stay in equilibrium while you are gone. 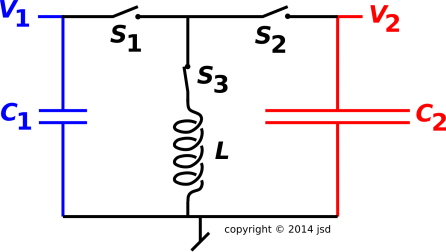 The operation of the circuit in figure 3 is much more complex. You have to open and close various switches at various times, and the timing is critical. The circuit in figure 2 can easily be demonstrated in an introductory physics class. The circuit in figure 3 is much more energy-efficient, but it is not convenient to demonstrate. It requires a great deal of supporting circuitry to get everything to work right. We can split the difference using the circuit shown in figure 8. Compared to figure 3, this circuit is much easier to operate. It is not quite as energy-efficient, but still much more efficient than figure 2. In particular, for large N, more than 100% of the gorge on capacitor C1 gets transferred to capacitor C2. 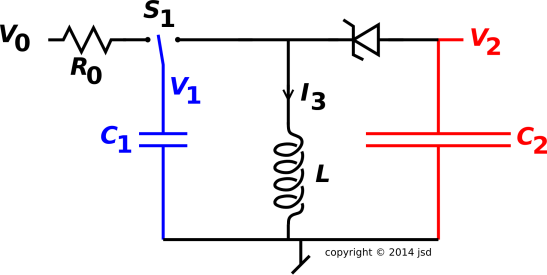 In this circuit, S1 is a double-throw center-off switch. The first step is to switch S1 to the left, so that capacitor C1 gets gorged up and V1 becomes equal to the applied voltage V0. We assume V0 is positive. We are not interested in the details of where V0 comes from; that is considered external to our circuit. Similarly R0 is considered external and not part of our efficiency calculation; it is just there for safety, to make sure the inrush current is not infinite when S1 is switched to the left. Our analysis begins after C1 has been gorged up; we want to see how efficiently energy and gorge can be transferred from C1 to C2. The second step is to switch S1 to the right. This forms an LC circuit involving C1 and L. At this moment, C2 is not involved, since the diode is reverse biased and therefore non-conducting. However, a short time later, the natural LC oscillation will bring the voltage V1 into negative territory. The diode is now conducting. If we arrange that the forward drop of the diode is negligible compared to the other voltages, the circuit is now equivalent to figure 3 with all three switches closed. The voltage V2 will be negative, opposite to the sign of V1. This is slightly inelegant, but it is part of the price we pay for having a circuit with a low parts count and simple operating procedure. After capacitor C2 is fully gorged, the diode will stop conducting. The LC circuit formed by C1 and the inductor will continue to oscillate with a small amplitude, less than one diode-drop. At some point you will want to open switch S1. Ideally this should be done at a point in the cycle where the current I3 is positive, where the positive direction is “downward” as defined by the circuit diagram. However, this sort of fine timing is contrary to the spirit of ultra-simple operation. Therefore the recommended procedure is to simply wait until the LC1 oscillations have died out (due to the inevitable parasitic dissipation) before flipping the switch. Another possibility is to use a Zener diode, where the Zener breakdown voltage is larger than V0. This protects the diode against the possibility that somebody might throw the switch in such a way that the inductor tries to force current through the diode the wrong way. Consider the scenario where V0 = 24V and N = C2/C1 = 10. In this scenario, the circuit in figure 8 (compared to figure 3) delivers 3× more gorge and 3× more energy to the output capacitor C2. For larger values of V0 the advantage is even greater, because the diode-drop is less of an issue. Also larger values of N make the advantage even greater. In any case, the fundamental physics point remains: It is possible to transfer energy and gorge from one capacitor to another with very high efficiency. Note that a lot of smart people have gotten this wrong over the years. A lot of people assumed – or even “proved” that the results in equation 3 were mandatory and universal. Let this be a warning: Just because you cannot think of a better way of doing things does not prove that no better way exists! It is often asserted that there must be “some” parasitic resistance. It is then assumed that when the explicit resistance R approaches zero, the parasitic resistance begins to dominate the impedance. This is false, because it could also be that some parasitic inductance dominates instead. It is sometimes loudly asserted that things “naturally” happen in the most dissipative way possible. This is not generally true of the natural world, and it is certainly not true of living things or engineered things. There is pervasive confusion about the distinction between charge and gorge. Charge is strictly conserved, and the circuit in figure 2 happens to conserve gorge, but this does not mean that gorge is necessarily conserved. Really not.